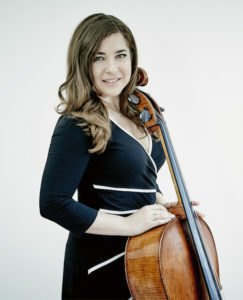 Renowned cellist Alisa Weilerstein, recipient of a 2011 MacArthur “Genius” Fellowship, brings her technical precision and impassioned musicianship to the extraordinary task of performing all six of Bach’s solo Cello Suites in a single evening on Friday, November 9, 2018, at 7:30 pm, in the Bram Goldsmith Theater at The Wallis. After years of playing the pieces individually, this season marks only the third in which she has ventured to perform all six. Weilerstein has justly earned international acclaim for emotionally resonant performances of both traditional and contemporary music and has been lauded as “too big a talent to be pigeonholed” (New York Magazine). Bach’s Cello Suites are widely considered to be among the composer’s greatest works. The music, which “maps humanity in all its triumphs, joys and sorrows” (National Public Radio), was written around 1720 and was largely unknown until famed cellist Pablo Casals became the first person to record all six suites, elevating their status so that they are now among the most popular and widely performed cello works ever written. In addition to her Wallis debut engagement, this season Weilerstein gives solo performances of Bach’s complete Cello Suites in Boston’s Celebrity Series, the Saint-Denis Festival in Paris, the Elbphilharmonie as part of the Schleswig-Holstein Festival and for Cal Performances in Berkeley. The American cellist has long proven herself to be in possession of a distinctive musical voice with performances marked by intensity, sensitivity and a wholehearted immersion in each of the works she interprets. Weilserstein, who discovered her love for the cello at two and a half, made her Cleveland Orchestra debut at age 13 and made her first Carnegie Hall appearance in 1997. A graduate of the Young Artist Program at the Cleveland Institute of Music, the cellist also holds a degree in history from Columbia University. She has performed with the world’s leading orchestras and appears in recital around the globe.